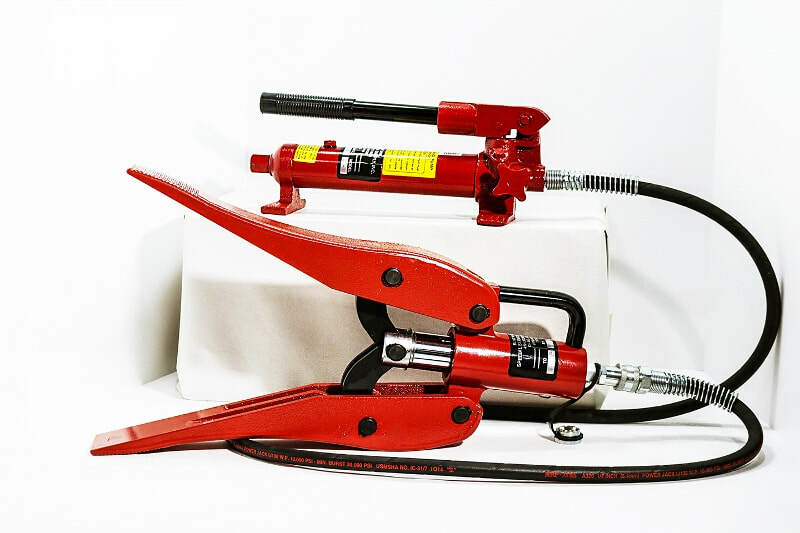 The Heavy Duty Spreader, Pump and Hose Set, Model H-17, frequently called a port-a- power or Hydraulic SPREADER tool set. This set consists of a completely redesigned hydraulic spreader which expands from 3/4” at the closed tips to 12" when fully opened. The spreader is operated by a new high capacity H-2T dual flow hand hydraulic pump through a highly flexible 72 inch long ¼” hydraulic hose at working pressure up to 10,000 P.S.I. The Spreader weighs only 21½ lbs. and provides 1.5 tons of spreading and lifting power at the tip of the fully closed arms. The Spreader has been completely redesigned to improve performance, provide easier operation and maintenance. An ergonomic handle has been added to the rear of the ram cylinder to provide better balance, operational control and easier carrying and handling. The redesign included strengthening the arms, elimination of the external springs, an upper bearing has been incorporated into the cylinder to prevent blowouts and deformation at full loads. The piston has received an industrial hard chrome plating along with precision burnishing the cylinder bore to extend seal life and improve retraction. A precision wound internal steel spring was installed to provide fast and complete retraction in all horizontal, upright and inverted positions. The operation speed has been tripled with the use of high flow ball check quick couplings to ensure free hydraulic oil flow without restriction. The completely redesigned H2S steel pump incorporates unprecedented reliability in those tough rescue or industrial situations with a host of new features, including the ability to operate the pump in the vertical, hose down and horizontal positions for easier operations. 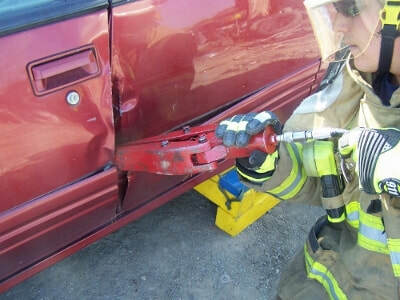 The "feet" on the pump are larger for more stability in horizontal operating position. reservoir under the handle for easier filling. The H2S pump is equipped with an internal pressure relief valve providing overload protection complying with ANSI/ASM B30.1 Safety Standards. This pump also has a larger control valve designed for easy operation while wearing gloves. A heavy duty pump operating handle with an ergonomic handle grip, a 20,000 P.S.I minimum burst pressure hydraulic hose with high flow ball check quick couplings completes the pump assembly. Weight: 36 lbs. Ships via FedEx Ground ®.